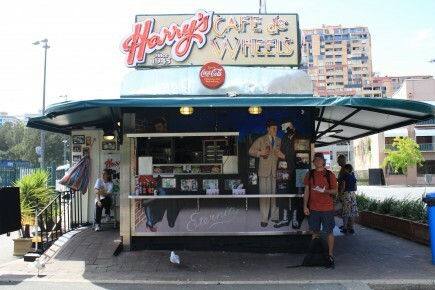 Harry’s Café de Wheels is a Sydney institution and has been serving up tasty meat pies since 1945. It’s open for business 18 hours a day and brings in Sydneysiders from all walks of life. From construction workers and Navy midshipmen to socialites and celebs like Russell Crowe, everyone leaves full and happy. The café became mobile and added the “de Wheels” when a strange Sydney law mandated that food carts move at least 12 inches every day. Law-abiding Harry’s would move one foot to the right one day and a foot back to the left the next. It has been positioned (more or less) at Woollomoloo wharf ever since it opened. While the neighborhood has changed – once a thriving Naval port left for dead and set for demolition and now the home to tactfully-renovated condos, restaurants and an upscale hotel – Harry’s has not. The café’s staple is the Tiger pie, named after its original owner, Harry “Tiger” —-. The Tiger pie is stuffed full of beef, mashed peas, mashed potatoes and lots of gravy. 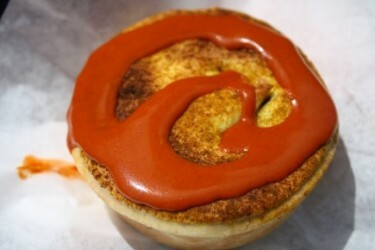 The menu offers a full take on Aussie pies, along with burgers and hot dogs. I opted for the less-traditional but still famous curry pie (pictured) and had it topped off with spicy chili sauce for an even greater kick. Standing up as all patrons do (unless you can nab a piece of log overlooking the wharf) and cutting into the pie with my plastic fork, I knew I was not to be disappointed. The pie, piping hot, oozed out with deliciously lean beef. The fresh curry powder added a welcome zest and the flaky crust played a perfect bowl and complement to the warm stuffing.